THE SUNDAY TIMES NUMBER ONE BESTSELLEROverall Book of the Year and Fiction Book of the Year at the British Book Awards 2017 (Nibbies)Longlisted for the 2017 Baileys Women's Prize for FictionThe Waterstones Book of the Year 2016Shortlisted for the 2016 Costa Novel AwardLondon, 1893. When Cora Seaborne's controlling husband dies, she steps into her new life as a widow with as much relief as sadness. 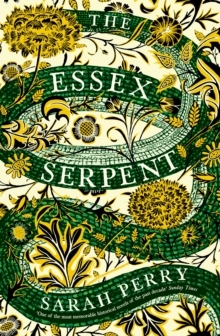 On arrival, rumours reach them that the mythical Essex Serpent, once said to roam the marshes claiming lives, has returned to the coastal parish of Aldwinter. Cora, a keen amateur naturalist with no patience for superstition, is enthralled, convinced that what the local people think is a magical beast may be a yet-undiscovered species. As she sets out on its trail, she is introduced to William Ransome, Aldwinter's vicar, who is also deeply suspicious of the rumours, but thinks they are a distraction from true faith.